A petition has been started to get Infinity Ward to add support for color-blind gamers to Modern Warfare 2. Color-blindness probably isn't something that you often think about in relation to videogames, but for the thousands of men and women it affects, it can be a significant hindrance when playing certain games, especially when playing online. 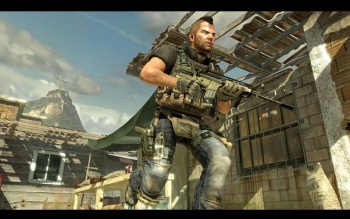 One such game is Infinity Ward's Modern Warfare 2, which uses red and green to differentiate between friend and foe. As red-green color-blindness is the most common form, this makes the game almost impossible to play effectively. Helen Hodsey has started a petition on behalf of her color-blind husband, as well as a Facebook group and has already managed to reach the ears of Infinity Ward's community manager Robert Bowling on Twitter. While online petitions rarely make a great deal of difference, I'm hoping that this one gets plenty of coverage, because unlike certain other Modern Warfare 2 petitions, it's for a very good cause.